Featuring two rows of diamonds totalling 0.13ct, this charming 9ct white gold band is the perfect choice for subtle elegance. 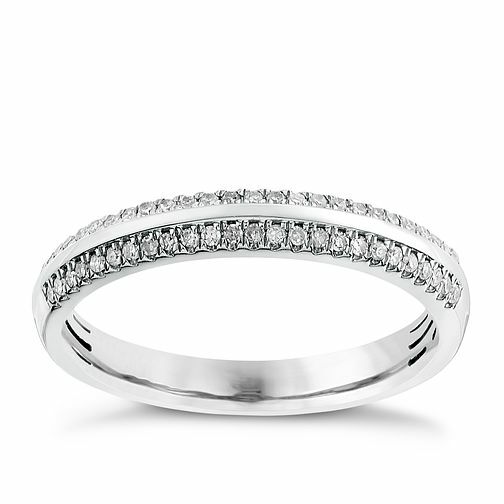 An enchanting wedding ring to symbolise the start of your new life together. 9ct white gold 0.13CT diamond ring is rated 3.5 out of 5 by 4. Rated 1 out of 5 by Anonymous from Diamonds fall out I got married in 2015 and since then I'm now on my third ring of this particular one. Two diamonds fell out of the first within first 6/12 months. Then the next ring lost a couple and was replaced this June (2018). Today I have noticed one has fallen out of this one. I was told in June that my engagement ring was rubbing against the claws so worth getting a ring in between the two so they don't rub. I did straight away and yet one has already come out. I'll be going back to my store again this week, this time I'll be asking for a completely different ring if possible as I don't want to keep having to replace my wedding ring every year,it's not what you expect from a wedding ring especially from Ernest Jones.